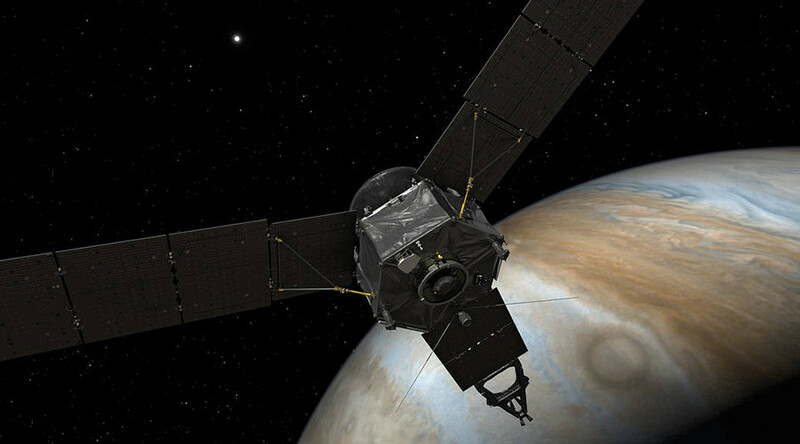 NASA’s Juno spacecraft will focus its high-spec, wide-angled camera on some of Jupiter’s most turbulent weather fronts as well as the planet’s south pole, after a public vote helped to narrow down locations of interest. Next month, as Juno glides again over the thick cloud covering the gas giant, the craft’s tiny four-color camera will be trained on at least 10 points of interest. The online vote regarding the Juno project represents the first time NASA has handed complete creative control of a mission to the public. NASA says the most votes went to areas identified as Oval BA, the Jovian Antarctica, the Big Red Stripe, White Spot Z and the south pole. A number of stormy regions such as a ‘dark spot’ in an area of turbulence will also be pictured. Launched in 2011, the latest NASA spacecraft trying to unravel the mysteries of Jupiter has been orbiting the giant gaseous planet for seven months and, to date, has carried out three close-up fly-bys. As part of its one way mission, it will make another fly-by on February 2 before eventually plummeting into Jupiter’s stormy ether in 2018 – by which point it will have traveled more than 2,106 million miles (3,389 million km). Onboard the spacecraft named after a Roman goddess is the JunoCam, designed to take snapshots of Jupiter’s little-studied north and south poles. Although stacked with the most up-to-date technology money can buy, NASA admit the solar powered craft has “limited” storage for images – which is why NASA has been asking the general public and amateur astronomers for their advice in choosing where to shoot. In a voting round for the Juno’s upcoming flyby, people had the opportunity to pick from 21 points of interest. The vote featured areas called ‘hotspots’, an orange belt of cloud cover and a corridor of dark turbulence located to the north of the planet. So far the seven-inch-long camera has beamed back images of Jupiter’s glowing southern lights and other never-before-seen perspectives of the gas giant. “We’ve had a number of spacecraft that have flown past Jupiter and taken pictures and taken movies but they’ve always been in the equatorial plane. So this mission is the first one that we really get up over the polar regions,” Candy Hansen, JunoCam co-investigator, explains on the NASA website. The US space agency previously allowed limited public input during a December camera test, when an area of anticyclone storms and a mysterious “weird dark spot” came out winners. The final images are due to be published in NASA’s processing gallery.